On the weekends this restaurant/bar can be quite happening. I haven’t really seen any muzungus to speak of, but all the more reason to come and dance! 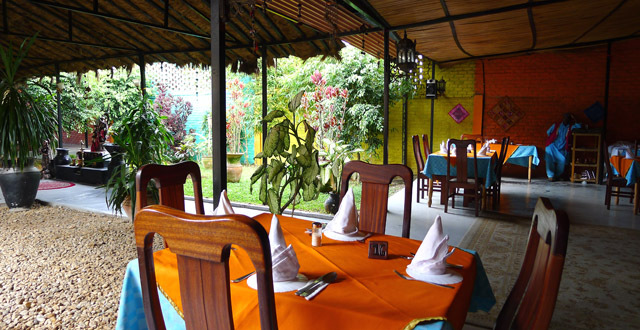 It’s right next to Downtown bar by the Gorilla Roundabout in town, and so a perfect place to dine if you’re planning on having drinks later. 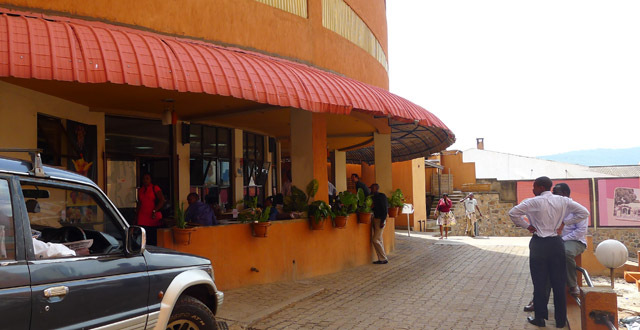 During the week, La Classe is a popular place to get lunch buffet (Rwf 2,500). They are one of the few places where I’ve seen ugali (not that anyone likes it apart from me), and they also have juice included. 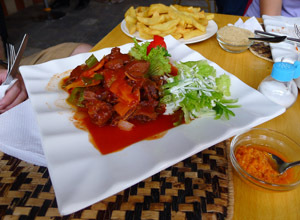 Compared to Karibu, the salad selection is not much to speak of, but the meat here is super yummy! Also, they have soup. That makes me happy. Okay, and I don’t have more to say about the buffet… so back off, Kirsty. Or write your own article! Hag. 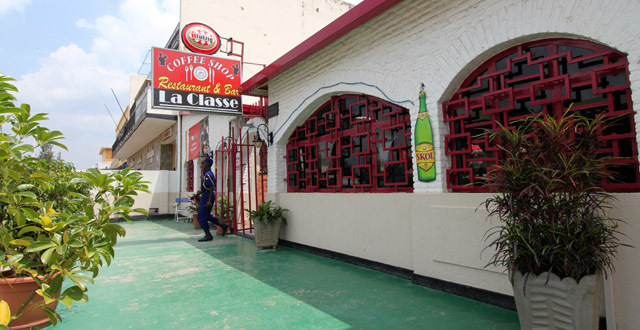 La Classe the only place in town we’ve found that serves something that at least resembles Caesar Salad (Rwf 3,000). Other exciting food items are roll-up lasagna and tacos. 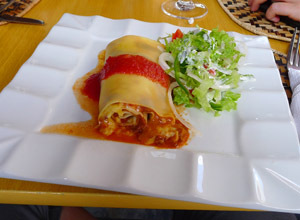 The interestingly-named lasagna was, in fact, rolled up. It was sort of one big flat lasagna noodle with meat and tomato sauce put inside and then rolled up. Hence, the name. It was pretty good but seemed heavy on the pasta and light on the filling. The tacos were more of an enchilada type tortilla of Mexican-y goodness. Not exactly what I was expecting, but tasty nonetheless. Certainly much better than the faux Mexican food offering at Shokola on Sundays. The goat here is also good and the hamburger is gigantic. The manager used to work at Bourbon, and makes no effort to hide the fact that the drinks menu is identical to his former work place. Thus, for a more affordable Funky Monkey Kawaccino or a Very Berry Smoothie, come here instead! The iced cafe mocha was good, but it seemed like the drink had been sitting around awhile before being served as all of the ice cubes had melted. But for Rwf 400 cheaper than its Bourbon equivalent, I guess I can handle that. What I like best about La Classe, however, is the outdoor patio. You literally sit on street level, and unless a parked car blocks your view, you can keep an eye on people and vehicles busying by you. Well, at night you can. There are no tables set outside during the day. I’m not sure if this is because of some local law against lunch time outside tables, or because the management is concerned about people frying in the afternoon sunshine. But at night it makes a nice spot for a drink or two. So for good food, affordable prices, nice staff, an attentive manager, a chilled atmosphere and a local clientele, check it out! We like it a lot. Hi, Inga thanks for the article and imput…your article is well detailed and very helpful esp. to people like me who plan to visit Rwanda in 2 months time. thanks again. Great review. Small request, but can you add phone numbers when you visit places? Finding out the numbers of places is really tricky, especially if they’re new and not in the old guide books, so would make a real difference. I would like to reserve a large table for big group at La Classe and can’t find the number anywhere! Thanks.